A grand challenge in the field of artificial life is to find a general theory of emergent self-organizing systems. In swarm systems most of the observed complexity is based on motion of simple entities. Similarly, statistical mechanics focuses on collective properties induced by the motion of many interacting particles. 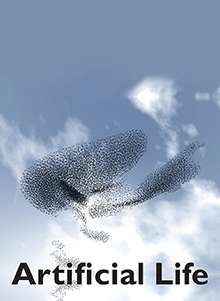 In this article we apply methods from statistical mechanics to swarm systems. We try to explain the emergent behavior of a simulated swarm by applying methods based on the fluctuation theorem. Empirical results indicate that swarms are able to produce negative entropy within an isolated subsystem due to frozen accidents. Individuals of a swarm are able to locally detect fluctuations of the global entropy measure and store them, if they are negative entropy productions. By accumulating these stored fluctuations over time the swarm as a whole is producing negative entropy and the system ends up in an ordered state. We claim that this indicates the existence of an inverted fluctuation theorem for emergent self-organizing dissipative systems. This approach bears the potential of general applicability.